I can’t believe how many days I obsessed about the color placement in the Log Cabin blocks. Finally I just went for it and started cutting out the strips needed. After all that drama and stress I am very pleased with end results. 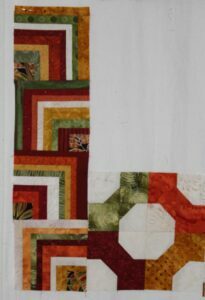 My best decision was to add some rows using the background fabric – I didn’t want these blocks to be dark & overpowering and the background lightens things up wonderfully. There was also enough time on Sunday to sew all the Stair Step blocks together, add the borders and have a completed quilt top. 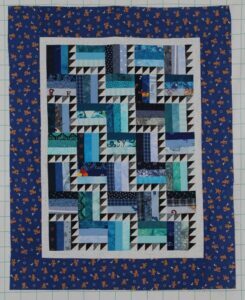 The white inner border and the medium blue outer border help lighten this quilt top (do you see a theme here?). The top measures 30 1/2″ x 38 1/2″ which will make a nice baby boy quilt for draping over a stroller or a baby carrier. This week I will be busy sewing HST for the next three Long Time Gone blocks. It will also be time to move it to a larger design wall. I am ready to see all the parts come together in a completed quilt top. After seeing everyone LTG blocks, I’m wishing I had joined in. They’re going to make a lovely quilt.